We are witnessing a systemic recasting of education priorities that gives official structure and permanence to a preexisting underclass comprised largely of criminalized poor black and brown people. States across the US are excising billions of dollars from their education budgets as if 22% of the population isn’t functionally illiterate. According to the NAAL standards of the National Center for Education Statistics 68 million people are reading below basic levels. The Center on Budget and Policy Priorities found that “nearly all states are spending less money (on education) than they spent in 2008 (after inflation), even though the cost of providing services will be higher.” On top of cutting 4 billion dollars from their budget, Texas has also eliminated state funding for pre-K programs that serve around 100,000 mostly at-risk children. North Carolina has cut nearly a half billion dollars from K-12 education resulting in an 80 percent loss for textbook funds and a 5 percent cut in support positions like guidance counselors and social workers among numerous other cuts. Decisions like these leave little reason to wonder why both those states are facing 27% drop out rates. Closing public schools has so become the rage that the state of California has even produced a best practices guide on how to close and make them fit for turn-around. Why not promote a ‘best practices guide for keeping a school going’ instead? Why make these decisions when we know that a lack of education decreases access to quality (and legitimate) employment opportunities, increases the likelihood of encounters with the criminal (in)justice system, negatively impacts health outcomes, and altogether limits one’s ability to determine her or his own future? What we’re witnessing is a systemic recasting of education priorities that gives official structure and permanence to a preexisting underclass comprised of largely criminalized poor black and brown people. Certainly having a prominent underclass isn’t new to the US as it has quite the track record of denying fill-in-the-blank people fill-in-the-blank rights. But the material outcomes of this shift are as communally and economically devastating as were the outcomes of the Black Codes in the 1800s and subsequent Jim Crow laws that persisted until 1965; both of which were legal, with implementation that varied from state to state and still impacts communities today. The collusion between this government and private interests are not new either. It is not a coincidence that at the same time neighborhoods with high incidences of black people are being destabilized and displaced through fast track urban-land grabs, or gentrification, by developers empowered by local municipalities states are divesting from the public school infrastructure serving them. This is an insidious process that forces the hand of communities. Public education is something more than a right, a liberty, or a privilege. It is a need. One as basic and inarguable as the land we must walk on, food we must eat, water we must drink, and air we must breathe to live. For absolutely nothing will or can be done in human society without it. So who would want to send their children to schools that have police presence and metal detectors in place of books? Or to overcrowded schools with teacher to student ratios of 1 to 30 and little to no extra curricular activities or wrap-around services? These are the material consequences of divestment from public schools. Who wants to send their children to schools in neighborhoods that are mini-police states? If it can be helped, no one. Charter schools by definition aren’t the real problem. They have been practical and creative solutions to educating children when needs go unmet. Forming alternative centers of education has been a norm practiced in communities across the country since the 1800s. But what we have today is something very different. Charters now elbow out established public schools in part or completely. Corporations like Wells Fargo, BOA, JP Morgan,and Wal-Mart, all major investors in private prisons and players in corporate education reform, have extraordinary influence on education policy at the state and federal levels. Parents, students, teachers, and other relevant stakeholders are manipulated into making a false choice, drawing a line in the sand where the wrong group of people is on the opposing side. Whether for public schools or charters, both sides want the same outcomes - creative, critical thinking students who are equipped to participate fully in their community and society at large. Instead of charters continuing to operate as creative workarounds, especially for communities in crisis, sharing in the resources for the public, they’ve been co-opted. Now taking an antagonistic role towards traditional public schools. While these turf wars are being fought, the children who don’t make it into the tier one schools or roll sevens in the charter lotteries are left behind and to their own devices in these poorly administered, under resourced and overcrowded schools. 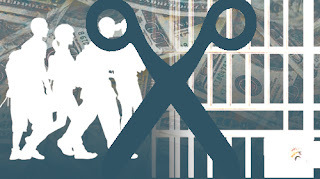 Forty-six percent of the 2.3 million people incarcerated are without a high school diploma and the skills to compete in an ever-shrinking job market. This means roughly a million people won’t ever get a shot at what should already be low-hanging fruit—a low-waged, skill-lite, benefit-deplete, socially unrewarding job with a work environment that’s likely to be mentally and spiritually stifling. Little guesswork is needed around what will happen to these unskilled and undereducated millions who have been failed by these schools that continue to be eroded. It is the prisons that will have them; for these youth are the preferred meat of the criminal (in)justice system. This is why we can have record closings of public schools throughout the country, and at the same time witness the rise of corporate backed charter schools and private prisons. The message to the people being that a select few will be educated and the rest will be locked in struggle against their own commoditization. This is why we must continue to fight. Adwoa works as the Office Manager and Internship Coordinator at IPS. She is also a student at the University of the District of Columbia, pursuing a degree in Graphic Design. A Nation Divided: Can We Agree On Anything?